Building the new high school is only the first step in a comical quest line involving mostly Principal Skinner and Superintendent Chalmers. Once these three parts of the quest are complete you’ll unlock the ability to build the Springfield Knowledgeum. It is the most expensive building in the game required for the story to continue, with an asking price of $379,500. If you’re struggling for cash, you may want to hold off until the next update. Building prices tend to get cheaper as new content for the game is released. The Springfield school system feels so much more complete now that Super Nintendo -intendant Chalmers has been added to the game. It’s always a pleasure to have another voiced-character added into the game, and lets be honest, this update wouldn’t have been nearly as fun if you couldn’t hear him shout “SKINNERRRR!” when you tapped on him. Once the Springfield High School finishes construction he will unlock, setting off the quest line for this update. If you take a look at his task list you will notice that his tasks are evenly divided between indoor and outdoor activities. One other thing to note is that he is the first, and only character to have a permanent task in the All Night Gym. In the beginning of the game you are prompted by Professor Frink to visit Other Springfield for the first time. This is a template town designed by the developers of the game to allow players to view an example of an organized town. As you progress further through the game this town evolves alongside yours, usually a few levels ahead of you. This element was incorporated to give players something to shoot for, to make their towns as complete and aesthetically pleasing as Other Springfield. Above is a map of what this town looked like when it was first starting out. If you’ve been playing for a considerable amount of time this map may bring back memories of the first time you tried to build a town. 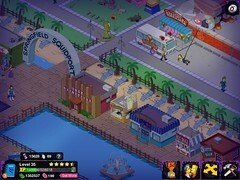 For new players, this map is a replica of what you’ll see when you visit Other Springfield. How far along are you in Krustyland? Krustyland was first introduced just about a month ago, so how far along are you in completing your theme park? The forty-one part quest is quite time-consuming, particularly when purchasing new attractions. Were you ready for Krustyland as soon as it was available, or did you have some catching up to before you could start developing the theme park? For some, the $50,000 required to build the Krustyland Shuttle may have been too much, especially when so much new content has been added to Springfield as well. Judging by the comments I have received, many have found it has become a bit of a chore to balance between the two maps, particularly when characters are required to be active in both. So are you enjoying Krustyland or are you just looking forward to finishing that final quest so you can put all of your focus back into Springfield?